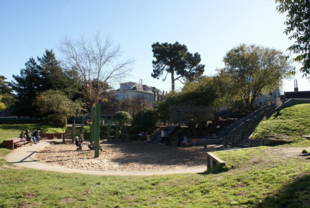 Situated next to Mountain Lake where the southern edge of the Presidio meets the Richmond District, this park offers many different amenities. Dog lovers flock here for the dog run at the eastern end of the park. In the middle of the park are four full tennis courts, and nestled closer to the lake shore is a half basketball court. Children enjoy the sand-floor playground at the 12th Avenue entrance that feature slides, swings, and a multi-level play structure, while runners can make use of the built-in fitness circuit. New restrooms are available on-site. There is a covered picnic/card playing pavilion opposite the 9th Avenue entrance. The great meadow is a favorite place to spend the afternoon for a picnic or to rent for children's birthday parties. 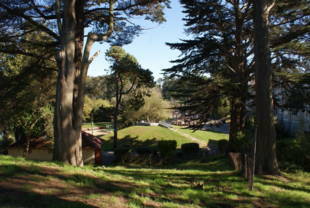 Mountain Lake Park is owned by the San Francisco Recreation and Parks Department. Muni access: #1 - California -- California St. and 12th Ave. #28 - 19th Avenue -- Park Presidio Blvd. and California St. In the spring of 1776, after a 900 mile journey from what is now Mexico, Spanish Captain Juan Bautista de Anza and his soldiers came upon Mountain Lake and found the lake an ideal location, as it offered abundant water and pasture land. They broke ground half a mile from the lake and called the settlement the Presidio. The lake suffered damage in the 1930s when the MacArthur Tunnel was built, and dirt and rock from the construction were dumped into the lake. Subsequently, nitrogen and phosphate run-off from the Presidio golf course has polluted the waters. 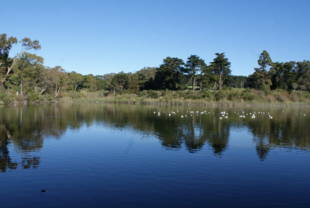 Today efforts to save Mountain Lake from becoming an environmental disaster are underway, led by the Friends of Mountain Lake and involving the Golden Gate National Parks Conservatory, the Presidio Trust, the National Park Service and researchers from the California Academy of Sciences. Recently the San Francisco International Airport provided $500,000 in mitigation funds to clean up the north arm of the lake. The Mountain Lake Enhancement Project, underway as of summer 2013, will, in addition to the dredging, include removal of non-native species of plants and installation of natives. 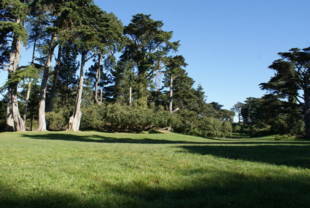 The lake is 14.2 acres, of which 13.1 acres are within the national park and administered by the Presidio Trust. Mountain Lake has become a living classroom for researchers at the California Academy of Sciences who are using it for students from middle school through college who serve as 'science citizens.' They are collecting data on habitat patterns among the birds, reptiles, amphibians and zoo-plankton that thrive in the lake. With Rec and Park's Natural Areas program, the Friends and students from Wallenberg High School have collected native seeds and planted them along Mountain Lake's beautifully renovated southern shore. Says the Friends' Judy Whilt, 'We are grateful indeed to the groups who have come together to rescue one of San Francisco's three freshwater lakes and one of its historic jewels." Events or Parties: Picnic tables and proximity to playground, fields, and beach make this a nice spot for birthday parties. The phone number for reservations is 415.831.5500.